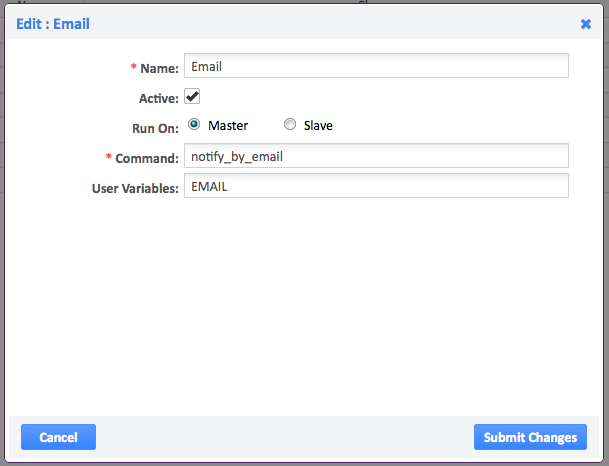 The email Notification Method requires minimal configuration. 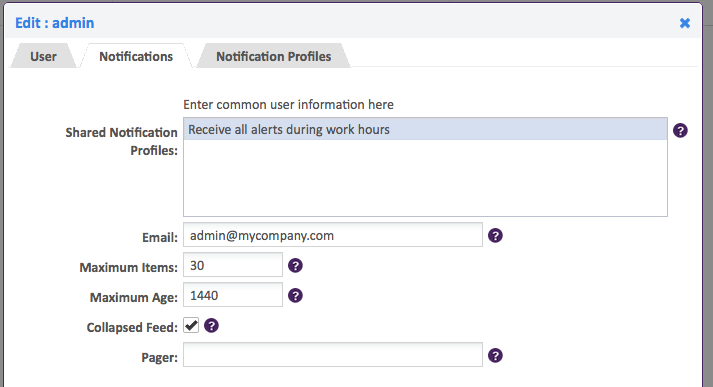 The 'Active:' checkbox tells Opsview Monitor whether to list Email as a valid Notification Method when you are creating Notification Profiles for yourself or other Users. 'Run on:' tells Opsview Monitor to send alerts either via the master or via the slave servers (this can be useful if you have different configurations for postfix, sendmail, etc on your slave servers than your master). Command: This is the script to execute. It is assumed that this script is stored in /usr/local/nagios/libexec/notifications. Add any command arguments as required if modifying the Notification Method . User variables: 'EMAIL' is the name of a Variable that will be passed to the notify_by_email script and its value is the destination E-mail address for the Notification. Simply ensure that the local mail server is configured correctly and can successfully deliver emails to email addresses. Generally configuring the local email server as a simple relay Host is sufficient, i.e. setting 'relayHost = mail.company.com' for example. To change the 'sender address' for email notifications, simply modify /etc/mailname for the domain section (i.e. right of '@'). To modify the User/account section, i.e. 'opsview@', follow the specific guides for your email server of choice. In postfix, you can adjust this using the 'sender_canonical_maps' configuration parameter. For a guide see the Ubuntu Forums post here: http://ubuntuforums.org/showthread.php?t=38429. The email template is written in Template Toolkit and exists in /usr/local/nagios/libexec/notifications/com.opsview.notificationmethods.email.tt. You can customise this file, but be aware that it will be overwritten as part of any future upgrades.